A well illustrated book comparing childhood in India and the US from the perspective of two young boy pen pals who send each other art showing their lives. Both kids do similar but different things each day: both take a variation of the school bus, both have pets of one kind or another, both live with their families. Basically, it’s the Same, Same But Different which is one of the many sayings that come from India. 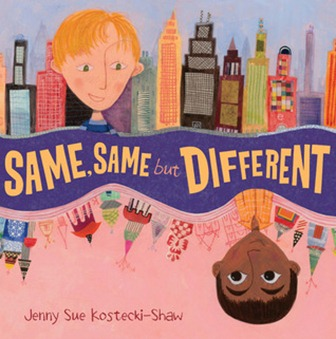 This book is an effective way to emphasize the point that kids are kids throughout the world, who may live in different countries, but still have similar lives and concerns: families, school, pets… The book’s collage illustrations are excellent as well. 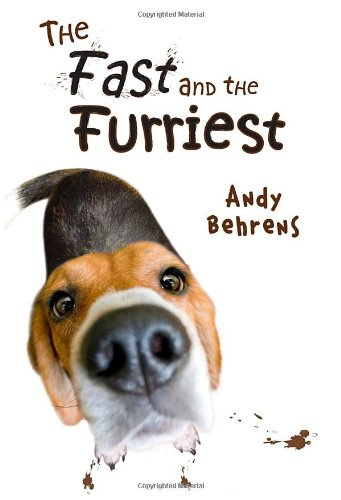 A fast-moving and exciting story of a twelve-year old boy and his dog. Kevin’s father is a former successful NFL Chicago Bears player, but Kevin is more of a reluctant athlete who would rather play computer games than real-life football. One day, sitting in the basement watching TV, Kevin’s dog sees a program on dog agility and that opens the door to a very different world for both of these non-athletic characters. However, Kevin and his dog are not perfect and have to practice all summer to compete with the help of his best friend. Kevin learns to believe in himself and in his puppy in their quest to become the “fastest and furriest” champions. Do they succeed? You’ll have to read it to find out! This title sounds as though it should be placed in the “Self-Help” section of your local bookstore, but it’s really a more scientific study about human habits along the lines of Malcolm Gladwell and his ilk. 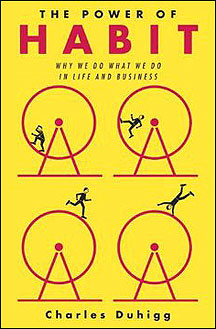 Duhigg is a New York Times reporter and has researched the area of human habit in depth, looking at various studies from multi-disciplines and then applies what he learns to help you change your habit, whether it’s a health-related behavior (like stopping smoking) or shopping more effectively at the grocery store. It’s not all about one’s habits either: it also discusses what makes a song a top 40 hit, why stores are set up in certain ways, and what role habits played in the U.S. Civil Rights movement. A fascinating and non-technical look at a very human behavior, this is a good read. Stay tuned for next month’s column… March already! This entry was posted in Uncategorized and tagged Books in general, Fiction, Non-fiction, review by lizipaulk. Bookmark the permalink.